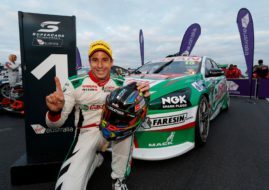 Australian V8 Supercar Championship is one of most interesting racing series on the planet. Since 1997, this championship is known for top notch racing action, lots of excitement, on track contact and grid full of powerful roaring V8 sedans. In 2014, V8 Supecar season consisted races held in Australia and neighbouring countries (New Zeland) with first one held on 1st of March 2014 in Adelaide and last one on 6th of December 2014 in Sidney. The best thing about Australian V8 Supecars championship is, of course, the cars, the mighty V8 powered saloons from various manufactures. In the beginning, domestic Ford and Holden were the only choices for teams, but since, Mercedes and Nissan has entered the series. In 2014, Volvo S60 run by Polestar Racing has made a debut in V8 Supercars championship. However, displacement of the engine is limited (5.0 liters) with no turbo or supercharger. Estimated horsepower is more than 635 bhp and all teams must use Albins ST6 six speed manual transmission and sanctioned electronics package. Race ready vehicle weights 1400 kg (with the driver) and top speed is over 300 km/h. Acceleration varies from track to track, depending from set up. This year, Holden VF Commodore proved to be dominant force on track with 26 pole positions and 27 victories in 38 races. Volvo had a strong debut with 10 podium finishes and exceeded all expectations for a newcomer in the series. So, when you have 16 teams and 26 drivers running this kind of race cars on some of the Australias best race tracks,excitement and fierce track battles are guaranteed. The 2014 V8 Supercars championship was won by Red Bull Racing Australia driven Jamie Whincup (Holden VF Commodore) who finished first in 14 races with 10 pole positions. Second in the championship was Shane van Gisbergen with 5 and third was Mark Winterbottom with 4 wins. Jamie Whincup also had 11 fastest laps during a season and 21 podium finishes. This was a 6th V8 Supecars championship win in a row for Whinecup, who is now one of most succesful drivers in a history of the series. Whinecup is also a four time Bathurst 1000 winer, but in 2014 famous Bathurst race was won by Chaz Mostert and Paul Morris (Ford Falcon FG) who started last but finished first, after Whinecups car run out of the fuel, in one of most interesting races of the season. However, it is safe to say that best is yet to come in 2015 season since every team and driver is going after Whinecup and his Red Bull Australia Racing Holden VF. We could expect that Polestar Racing Volvo S60 is going to be even more competitive in 2015 and Ford to recover from very disappointing season. First tests are scheduled for beginning of February and first full race is Clipsal 500 Adelaide on 26th of February so stay tuned for another interesting year of Australian V8 Championship racing action.